Technicolor Kitchen - English version: Little fig and blackberry pies + "Sid & Nancy"
Little fig and blackberry pies + "Sid & Nancy"
One of my goals for last year was to use my cookbooks more often and I am very pleased with how it turned out – I did use them a lot and intend to keep doing that. For 2012 I have a new goal: to watch more movies, especially the ones I, for some reason, did not watch in the theater. I started off with “Sid & Nancy” – because of my Oldman-being-nominated frenzy – and well, one could say I started with the right foot: not only is the movie really good – deals in a very raw way with a very raw subject – but it also shows that this man was born to be an actor; he develops the character in such way that I had mixed feelings about him throughout the movie, and he adds, very subtly, a layer of frailty to Sid Vicious that one probably wouldn’t expect to see on a punk. I don’t need to tell you about the perfection of his visual transformation because that is something he’s done in every single movie he’s made so far. I really liked “Sid & Nancy” but drama is always my first movie option; if you’re a comedy kind of person think twice before watching it. Lightly butter four 10x5cm (4x2in) deep tartlet or mini cake pans. Set aside. Place flour, icing sugar and salt in the bowl of a food processor and blitz to combine and remove any lumps. Add the butter and process until the mixture resembles coarse breadcrumbs. Add the yolk and the vanilla and process just until the dough starts to come together. Transfer dough to a large piece of plastic wrap and bring it together into a disk, then into a fat cylinder. Chill for at least 1 hour. Preheat the oven to 200°C/400°F. Rinse the fruit, roughly chop the figs, and toss with the blackberries, honey, lime juice and almond meal. Cut the pastry into four, then flatten each piece on a floured board and use to line the tart pans, leaving the excess pastry overhanging the edges. 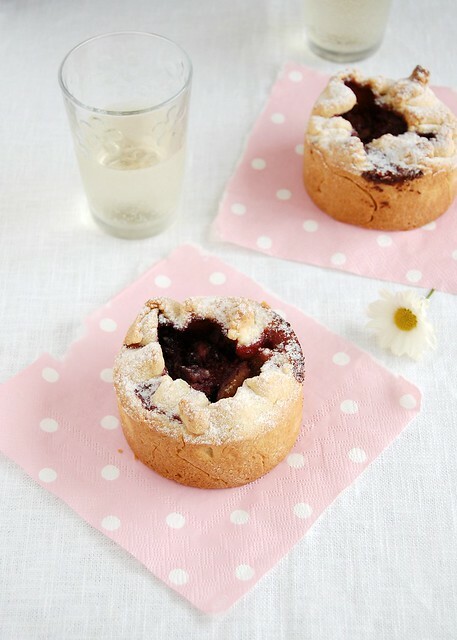 Pile the filling into the tart cases, then loosely fold over the pastry – it should not meet in the center, but instead leave a gap through which the fruit is visible. Place the tarts on a baking sheet and bake for 30-35 minutes, or until the pastry is very golden and the fruit is bubbling. Dust with a little icing sugar and eat warm or at room temperature. I call this kind of dessert too cute to eat! Coconut custard bars + the unforgettable "Hugo"